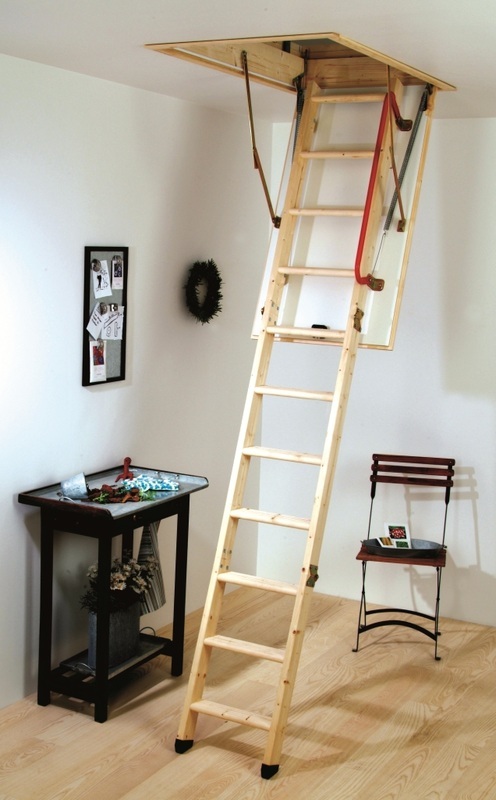 The Komfort is a 3 section folding timber loft ladder with an insulated draught proof hatch. Manufactured in spruce wood, the MidMade range of loft ladders are extremely safe and sturdy loft ladders. You have a choice of two LEX loft ladders - one with 30mm insulated hatch door, and the other has a 70mm insulated hatch door. The hatch door is finished with a white base coat, which can either be left as it is, or painted to match your existing decor. The door is spring balanced with a recessed sealing lock, which is easy to use with the opening pole. It also has a sealing strip to stop heat loss and downward draughts. The MidMade Loft Ladders fold into three sections which sit on the hatch door, meaning minimum clearance is needed in the loft itself. Plus, you lose virtually no storage space in your loft. The picture above shows the MidMade loft ladder with a handrail, which is an optional extra for both the LEX 30 and LEX 70 models. We also have a nationwide supply only service for the MidMade Loft Ladders LEX range. Our prices are extremely competitive and are fully inclusive - including delivery. to discuss delivery dates which are convenient for yourself. Delivery is made on a weekday and is any time between 8am and 6pm. The delivery MUST be signed for on receipt. WE ONLY SUPPLY THE LADDERS LISTED BELOW. WE DO NOT CARRY ANY SPARE PARTS. Handrail, which can be installed onto any of the models.